Rental Price 14,000 - 21,000 Thai Baht per month depending on season and length of stay. 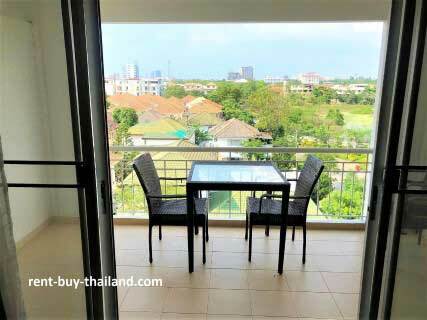 This is a great studio apartment, on the 5th floor of the Baan Suan Lalana Condominium, which is has been recently refurbished to a high standard and comes fully furnished and ready for you to move in. The apartment consists of an open plan accommodation consisting of living, kitchen and sleeping areas with a separate bathroom and a balcony. The modern, European style kitchen is well equipped with everything you need and includes a toaster, microwave and refrigerator, along with an electric hob and an extractor fan. The main living area contains a double bed and plenty of storage space, including a wardrobe, bedside tables, display unit and a dressing table with stool. There is also a sofa, coffee table and a flat screen TV and DVD player, along with access to the balcony via large sliding doors. The modern bathroom is fully tiled and finished to a high standard - featuring a glass basin, a toilet and a large walk in shower.. The balcony, which comes with balcony furniture, provides lovely city and rural views. The apartment also benefits from a fantastic feature ceiling with concealed dimmer lighting, along with air conditioning, ceiling fans and tiled flooring throughout. Baan Suan Lalana is a beautiful complex in Jomtien set in luscious green gardens, offering a lovely quiet, secure and relaxed environment for residents. The complex is approximately 800 meters from Jomtien Beach, where you will find plenty of restaurants, shops, markets, bars and water-sports along the 6 km beautiful sandy beach. There are many amenities within the complex, including: two tennis courts, three large swimming pools, two saunas, table tennis room with three tables, a fitness center, a library, several children's play areas, a cafe, restaurant, laundry service, parking and 24 hour porter service at the security gate. Other Baan Suan Lalana Pattaya apartments are available, please inquire for further details.